Today I went to Old Vicarage School where the pupils presented me with a huge cheque both metaphorically and physically ! 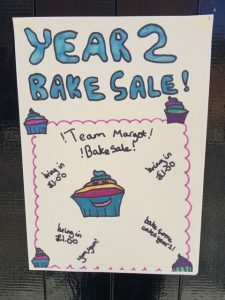 Team Margot Foundation was selected as the school’s charity when Margot’s cousin and her friends nominated Team Margot as one of the charities for their school to consider. 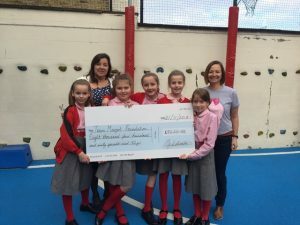 The girls were thrilled to have won the subsequent school vote and earlier today I was presented with a very large cheque for £8,460.82, raised for Team Margot Foundation, which was the result of the school’s sponsored walk. The sponsored walk took place in early October and all the girls from reception through to year 6 took part in the walk, with the older girls walking around 5 miles. This is in addition to previous monies raised from cake sales and school projects that have taken place and we’ve been told there is yet more to come ! All the charity trustees are overwhelmed by the amount of money that has been raised and we would like to again thank the pupils and teachers at Old Vicarage School for this fantastic achievement, that will go towards helping families that are struggling to make ends meet, whilst caring for a child cancer patient.